How does roti fluff up? Me: When roti put on fire the moisture in dough of roti converts into steam and, due to more heat, volume of gas inside the roti increases which causes it to swell. Are you able to make round rotis like your mother? (she smiled sarcastically) and said, "I don't think so"
One of my friend got placed in an MNC based in US. His parents were worried over the fact that he will not be able to make round chapattis, thus decided to marry him off before leaving to US. Fortunately they found a girl who can make round chapattis, today he is eating round chapattis. Girl1: I am manglik and my parents are facing some problems in looking up a groom for me. When one of them visited us, I cooked chapatis in dinner. I don’t know what happened to me at that time, rottis got distorted in shape. And they concluded that I am purely manglik that I cant even cook round rottis. Mohan yelled at his newly married wife, "How many times I need to remind you I don’t want to take tiffin from home, you will never learn how to make round chapattis, and I no more want to get embarrassed in front of my colleagues". His wife was concerned about him being hungry daily and practiced for the remaining day. But probably the priority of round rottis was way above than the basic need of food. Most of you would have guessed the commonalities in all the examples-the fuss over round rottis. Let us forget about all these remarks mentioned above, but anyone can please tell me why so much fuss over round rottis. 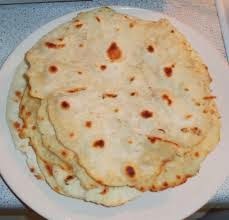 Think logically, is there really any difference between a round rotti and a non round one(probably with shape of India, Pakistan or some amoeba)? Assuming their ingredients(dough) are same with same equipment(rolling pin, rolling board and hands). If that is the case, then why do we eat the close cousins of roti so deliciously- paratha(triangular or oval), naan, rumali roti, kulcha. We don’t find any flaw in them. We humans too come in all shapes and sizes and nobody is perfect. Then why do we lay down baseless parameters like a ‘round roti’ to size up a woman’s personality? thank her first for making them and satisfying your hunger. Whether they are circular or not, they are rotis- a kind of food that should be given the respect that it deserves. As far as making round rotis are concerned, it's just an art of practice, and anyone can improve roti making skills. Neither it is a hallmark of a good girl, nor its absence a sign of getting your son married.